From Amman, Wadi Rum is a min. 2-day trip, and a good overnight destination. It is suitable for grownup kids, with fun camping facilities, basic, safe and providing acceptable roughing-up experience for a practical family. Tips: the main "famous" sights of Wadi Rum can be done in one full day, but for those who like hiking and exploring off-the-beaten-track walks, a two or three days would effectively leave a lasting impact. Wadi Rum is an ideal "exercise destination" it can help individuals caught-up in urban, unhealthy duties, to shape up their body and spirit. Rum is relatively cooler than the eastern desert and its dry clean air is therapeutic and invigorating. 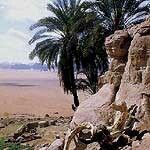 A trip to Wadi Rum can be combined with other obvious destinations, such as Aqaba or Petra. Other less famous destinations can include Humaima (an Islamic site west of the Highway to Aqaba) Udruh on the way from Petra to Ma'an, the gardens of Ma'an, and, during the cooler winter season, the back-door drive from Deeseh to Mudawwara. Not to finish this destination in one go, it is important to take one aspect at a time, to discover and enjoy this wide and unique landscape. This is a destination of varied attractions (general tourists attractions, mountain climbing, birds and wild plants, star watching, archeology, Bedouin culture… etc.) Rum can demand from certain types of visitors a lasting relationship culminating to a degree of devotion, it would keep asking its lovers to come back; Rum can enrich and educate some of us for lifetime. For now, the Rum destination would be explored through the water springs and the small, tranquil, special spots they create. Spots of little "hanging gardens" in the middle of this vast, dry, eerie, and peculiar landscape. Arriving to Wadi Rum feels like the arrival from an open outdoor space to an Indoor space of vast dimensions. This feeling acquires its full strength when you see the Rum village from a distance. This grand space is the largest and most defined corridor or gallery, with vertical walls and smaller side corridors. Rum can also be compared to a city with monolithic window-less buildings. The Main corridors run north-south, with one major corridor (Khor Ajram) running east-west, show a recognizable grid that respond to subterranean faults. The Meeting of Khor Ajram with Wadi Rum at Jabal Khaz'ali macks this mountain, Khaz'ali, a central alter-piece in a landscape that appears like a humongous ruined temple, with maroon walls and deep-blue ceiling. What is surprising, and often deceiving, is that the altitude of the "bottom" of Wadi Rum is 900 meters from sea level (1000m high at the base of Khaz'ali Mountain). This fact that is often wrongly assessed, as when we descend from Ras Al Naqab we think of Wadi Rum as when descending from Amman to the Jordan Valley. On this platform that appears like a" Wadi" or valley, Jabal Rum, the mountain to the west of the Rum Village is a unique monument. It is a chunk of sandstone, 700 meter thick, that sits of a pedestal of granite about 40 meter high to reach the total height of 1754 meter from sea level; Jordan's highest summit. It would be more accurate, geologically speaking, to think of Wadi Rum as tableland, with sandstone pillars standing on it, rather than a valley. The visible line of contact between granite and sandstone can organize our understanding of this natural monument. Below this line, granite, with its massive boulders, is exposed to us as a profile that looks like side of a ruined pyramid, with an overall slope close to 45 degrees. Above this contact line, sandstone stands mainly vertical, borrowing from architecture many elements such as domes, cantilevered monolithic shelves looking like balconies, and arches that, in time, form complete bridges. Sandstone behaves like an architect, one who is flexible, detail-oriented, and has a soft spot for ornaments. 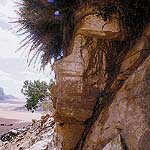 This contact line is also the boundary between rocks of opposite origins. Granite is igneous (was molten before becoming rock), it is Jordan's oldest rock, related to the "continental basement" that has formed by the cooling of the earth after it's creation some 4.6 billion years ago. Sandstone is sedimentary, has been built up in layers under water some 500 million years ago. From this point where rocks created by fire meet rocks created by water, a line of gentle springs hide within its depth many secrets of this strange land. There are two main springs on this line: Ain Shallaaleh (closer to the rest house) and Abu 'Aina further to the south. Besides these two springs, all along the contact line of granite-sandstone, water seeps out into light in different amounts. This line is a wonderful walk and easy to explore. It is like a crack in big clay jar seeping water; a secret that birds and plants learned so well and shared it with the Edomites, the Nabateans and the Bedouins. This water line is fed by the massive Jabal Rum, a chunk of sandstone that works like a big sponge sitting of a slab of impermeable granite. Granite, the harder rock, acts like a tray slopping eastward hence the location of springs on the eastern side of the mountain. The granite of Wadi Rum keeps sloping downward as we move to the east and disappears completely underground at the eastern parts of the protected area in the direction of Mudawwara. Wadi Rum is an experience in altering your visual scale; its vertical elevations are so vast that they can re-format your sense of proportions, completely re-setting the visual calibrations between vertical and horizontal. Rum is definitely an experience and possibly a transformation.